Business organizations of today are looking forward to various IT enabled services so that they can justify their existence and how IT services can help them to enhance the business revenues or even decrease the cost. With the growth in IT education and its immense use in various business sectors, the approach of doing business has changed and to attain the goals, software applications are used to make the processes faster, smoother and error free. To attain these goals, it is important to choose a good IT platform that will help you with the power to increase revenue generation and will produce reliable, scalable and quality applications. The Microsoft .NET platform helps to develop applications that meet specific business goals. Research and statistics states that .NET is the most preferred languages and about 28.1% of the web applications use the .NET technology due to its myriad benefits. The platform helps to reduce the development time, deployment hassles, cost and enhances the features of a particular app. When a person starts his own business, he decides to gain some profits back from his investments. This is called the Returns on Investments or ROI. This can be broken up into benefits and payback time and the benefit can be anything that will reduce the operational costs of a company or increase the revenue. 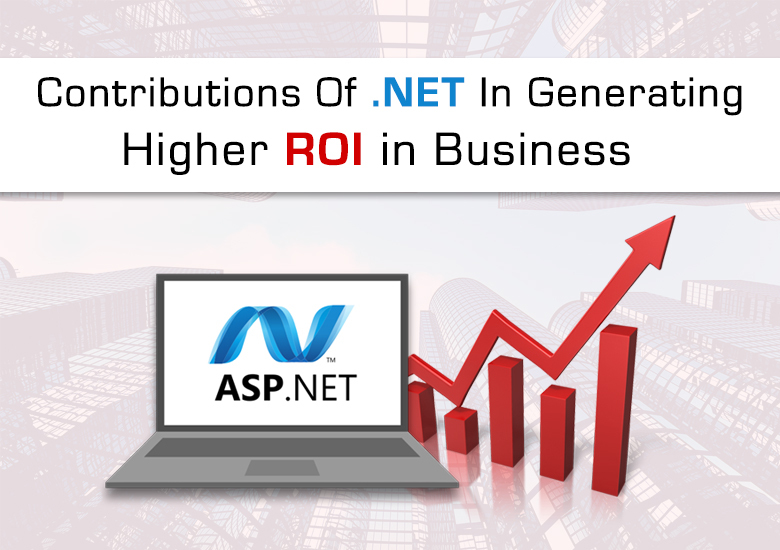 Choosing the .NET development platform guarantees scalable and efficient software and brings with it a large number of advantages for the overall business growth, productivity, efficiency thereby ensuring maximum ROI. Security and Reliability: The .Net platform has proven to be a very reliable engine for creating business applications. First released in the year 2002, it has helped to develop numerous applications, both for the small and large organizations. Even system support teams have been very satisfied with the reliability of the platform on Microsoft Windows Server 2003. The numerous built-in-checks and balances ensure that the system is always running and this is what is needed in every ecommerce websites. The framework has high quality security standards and can protect against malicious activities on the site, which is very important to gain the trust of customers leading to higher business growth. Simple and easy operations and maintainability: The .NET platform is a favorite with enterprises as it effectively reduces the total cost of ownership of the software. The applications are easy to modify and this can be done without the need to re-write the code. It is supported by technically enhanced features like shared code, no-impact apps and etc., which make deployment much simple and flexible. Since the versions are also properly maintained, there are fewer chances of code conflicts and this assures high end performance. Scalability: Another big reason .NET helps in increased ROI is its scalability. Various start-up companies grow faster and this puts a strain on the existing infrastructure. The .NET platform is designed with scalability in mind so that as the company grows, the applications can also support the additional load, which means less of re-working and re-developing applications that were not built for a large load. Multi-platform and cross platform support: Since .NET is a language independent framework, it is possible to work in various languages, which makes it highly approachable and flexible. Whether it is C, C++ , Visual Cobol, Ruby or any other, it can encompass all. The platform also allows the developers to create applications that can run on multiple devices or any types of browsers. Its reusable codes can support various types of applications. Reusable codes: This wonderful platform supports a lot of reusability in its code and there are also various components in the framework that can be reused too. This leads to a lot of time savings and also cost benefits and this helps to generate higher ROI or greater amount of productivity and profitability. Thus, I would say that the added benefits of reduced complexity, cross platform capabilities and increased security have helped to increase the demands of .NET technology and this has helped to boost operational efficiency and generate higher ROIs.